Not far from Old Montfort is the lovely village of Klaus. For those Who want to extend their tour, should ascend up the Viktorsberg near Röthis. 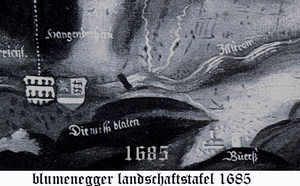 Viktor Berg, also Vogelsberg, south of Fraxern, separated by a deep mountain gorge, is called ‘middle Mountain’, with its continuation of the highest point on the “ball”, how it is called. It is situated near Bludenz in Austria, Vorarlberg. This mountain owes its name to the holy Pope Victor, and Martyr, of who a highly venerated relic is retained, It has no village, no hamlet, only scattered houses. 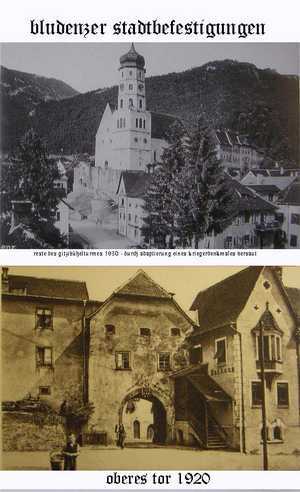 The parish church, in close vicinity of the living quarters, with the former Minorities monastery, where you can find the parsonage and the school itself on a beautiful hill projection. The church, formerly the abbey church is pretty, and in particular, has two beautiful stained glass paintings, of St. Viktor and St. Francis of Assisi. This well-shaped mountain with its quaint buildings grants a great view already out of Feldkirch, an exceedingly pleasant sight, but it also offers extensive and delightful vistas over the neighborhood, which it dominates. Besides the city is pleasantly busy ‘ Feld Mrch ‘ (Feldkirch) the eye can count still 25 villages with a friendly landscape that it overlooks here. 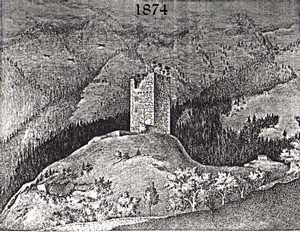 Historical books tell of a time, that once on the Viktor mountain a royal court (curtis regia) was situated with a hunting castle, where Charles the fat had stayed often. At the same time, there also lived a monk called St. Eusebius. He was by birth a Scotchman, and disciple of the famous Benedictine monastery of St. Gallen. His special love for solitude led him to ask abbots ‘ Harmut ‘ permission to be allowed to withdraw entirely into a wasteland. With the blessing of the abbot, he moved around the year 850 on the Viktor Berg and lived there for many years locked in his cell. He left the bower only rarely but lectured and taught all those who made pilgrimages to him, right at his dwelling place. Once he climbed down to preach God’s word, after Prederis, a little place that is below Rankweil ‘s Blach field. When he was satisfied of his religious zeal, he laid down exhausted from the heat of the day under a linden tree down to slumber. As it happened, at the same hour many pagan farmers came along the way. When they saw the Christian enemy they cut off his head with a scythe. In order to hide their misdeed, they buried St. Eusebius. St. Eusebius however, grabbed his severed head with his right hand, and after three rounds went up towards Viktor Berg. Emperor Charles the Fat had been his friend, and as such often came to him to the hermitage,called ‘ Bolgtw ‘ where the hermit predicted many things in the future. 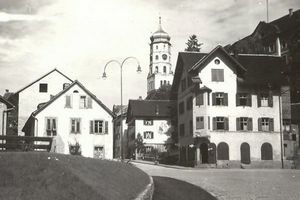 In the year 885, the named emperor gifted the Church of Röthis, with all its buildings, serfs, fields, meadows and alpine pins to the Bishop St. Gallen, but with the commitment to host and cater for the 12 pilgrims on Viktor mountains. 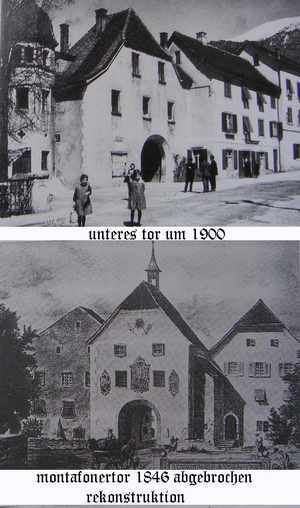 The local monastery belonged to St. Gallen, which performed to this end a monastic building. Thus, later it became the property of the Counts of Montfort. Rudolph VII gave the same 1381 to the Franciscans Order. In 1782 it was abandoned. – From the royal court and the hunting-lodge – by the way – no trace to discover any longer.